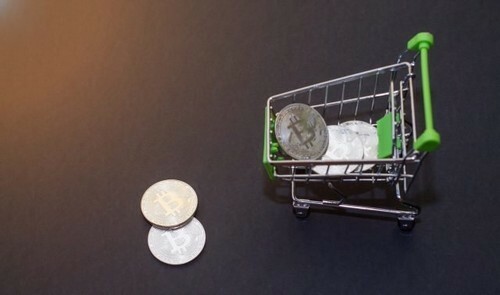 Shop trolley for purchases with bitcoins. Crypto currency bitcoin on a black background. Empty space for text. The retail industry is like an onion, with countless layers of intermediaries and supplementary services behind a customer portal like Amazon.com, all contributing to the convenience that customers experience when shopping. Any online platform that purports to serve some retail function is no different, even those with relatively straightforward business models. Discount and promotion sites that help local retail businesses pull customers from the web and into their store are some of these, and despite that some work as advertised, their ballooning presence in the industry has revealed troublesome fissures. Brick and mortar merchants can no doubt gain value from these services, but it’s no walk in the park. Services with origins on the traditional, centralized internet are themselves data consumers, and so can’t properly align their interests with their own users. As such, it’s possible to squeeze some value from them, but not sustainably or reliably. The industry has been mired in this sticky status quo for some time and hasn’t seen a way out until blockchain started hitting headlines. Clever retail innovators using the young decentralized ledger technology are already testing their freshly developed platforms with customers, and have managed to deliver stakeholders a better deal relative to the old paradigm. Groupon, FourSquare, and other large companies have created a de facto stranglehold on the location-based marketing industry, setting their own rules and focusing primarily on protecting their bottom lines to the detriment of all other relevant stakeholders. To give these customers access to information about their ripest local audience, they first must buy it from data collectors further up the funnel—dominant aggregators like Facebook or Amazon, which knows what products or services are sought after and where these individuals are located. In their efforts to cover these costs and more, Groupon institutes some questionable policies designed to push merchants to the limit of their finances. Coupons with a minimum discount of 50% are meant to entice customers to buy, despite that Groupon’s opaque campaign optimization tools make it difficult to break even. The coupons are also limited in their redemption to ensure that customers take advantage on the sooner side. Unfortunately, this attracts the wrong kind of customer—those that only visit to get a discount—and who will likely get a degraded experience anyway, because the business is being overrun by savvy shoppers looking to redeem their latest deal. Breaking even is all that many can hope for, yet there has been a scarcity of alternatives, until now. Blockchain has helped emerging retail engagement leaders like HotNow and Incent to turn the tables on this inequitable status quo. The first and most important ingredient in HotNow’s unique platform is their pivotal cryptocurrency HoToKeN, which is a more flexible, valuable version of the coupons that Groupon makes redeemable at local establishments. However, where Groupon cares only that customers buy the coupons, HotNow lets customers earn tokens by providing local merchants with value from the outset. Merchants reward customers autonomously via smart contracts associated with various customizable missions—crucial organic marketing activities like writing product reviews, answering a poll, trying and posting about a new item on the menu, or playing an interactive game. In turn, customers will be able to redeem these tokens on products or services at their favorite participating merchants, and even borrow them in bulk, if the ledger can demonstrate that they’ve been a loyal and active advocate. Another new entrant to retail is Incent, an Australian company using their INCNT cryptocurrency to help brands motivate certain behavior online. Their platform pivots on a cross-browser extension that functions as a tracker and cryptocurrency wallet. Incent essentially provides companies a channel directly to consumers who are willing to be paid for their valuable data, and allows them to conduct market research via the platform as well. These models better incentivize customers to deliver value from the beginning and sustain it long-term. Such a healthy retail relationship is only possible with a system in which all stakeholders benefit from adding value instead of siphoning it away, which befits blockchain specifically. Though the modern retail environment is defined by its asymmetries, blockchain is bringing a new dawn to businesses that used to have no other form of recourse. Blockchain marketplaces for any product or service are naturally self-balancing, due to the virtual impossibility of any single entity consolidating data or power. This is a better situation for everyone, despite the protests that will be heard from dominant and entrenched companies like Amazon, who have the entire industry in a headlock. A future on blockchain looks to be a bright place, but it first requires that companies provide encouraging, transformative platforms to draw users. Thankfully, they have many fine examples to gather inspiration from in their quest to create a mutually beneficial retail dynamic. As user adoption grows alongside the accessibility of these new utilities, the embrace of the ecosystem will only expand as all the relevant users and stakeholders derive benefits from its advantageous attributes.